Powers/Abilities: The armor worn by Metallo was virtually indestructible-- immune to even atomic weapons, and the effects of radiation. It also permitted its wielder superhuman strength (class 10? ), and was well-built for digging. The suit also contained an air supply for the occupant. The suit's one limitation depicted was its inability to swim. History: (Tales Of Suspense I#16)- After escaping from prison, criminal Mike Fallon decided to find somewhere to hide from the police. After noticing an advertisement placed by inventors searching for someone to wear an experimental radiation suit, he decided to use them as a hiding place, and the inventors gladly welcomed him aboard, under the alias "George Brown." Fallon was placed inside of the armor, and tested its ability to walk. Having done this successfully, they set off to an island in the South Pacific to test the armor against an atomic explosion. Fallon was left alone on the island. He survived the explosion and radiation-- but the island didn't! With the island gone, Fallon fell into the ocean. In the water, Fallon was assaulted by an octopus, but he managed to break its grip, and fought it off. He was soon recovered by divers sent by the scientists, and returned to the surface. 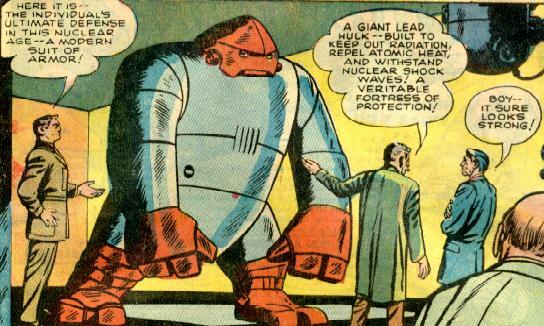 Next, the armor was to be tested against a nuclear missile. With Fallon inside the armor, it was raised up into the sky by a helicopter, and the missile was fired against it. Sure enough, the missile failed to penetrate the armor. Having seen all that the armor could accomplish, Fallon came up with a plan; why not use the armor to become a one-man crime wave? He refused to vacate the armor, and his true identity as a felon to the scientists, and set off to demonstrate the power of the suit to the world, knowing full well that he could not be stopped. Fallon decided to knock over the First National Bank of San Francisco as a start, and from the sewers, dug his way up into the bank vault! 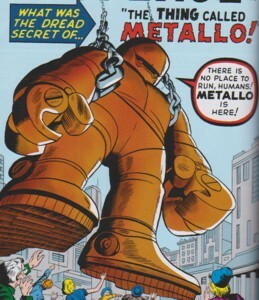 He quickly scooped money into the suit, then rampaged out of the bank, proclaiming his new identity of "Metallo!" Metallo easily fought his way past the police, destroying a police car in the process. As he swung past Alcatraz, Metallo decided to head over there and break out the entire population of the prison, so that he could lead them as an army. He walked across the bottom of the bay until he reached Alcatraz, and broke into the prison. But before Metallo could set a single prisoner free, he collapsed in pain. He dragged himself to the prison hospital, and demanded that the doctor there help him. He described his symptoms to the doctor, and the doctor replied that he would require radiation treatment in order to live. Unfortunately, Metallo's suit made him immune to radiation. Unable to determine if he should remove the armor, live and be sent to prison, or remain within the armor and possibly die, Metallo set off into the mountains to sort out his dilemma. (Monsters Unleashed II#2) - The Inhuman Kid Kaiju summoned Metallo (the cover version from the original story) along with numerous other monsters to an area outside San Diego, California in defense against the Leviathons. (Monsters Unleashed II#3) - Metallo joined the fight against the Leviathons. 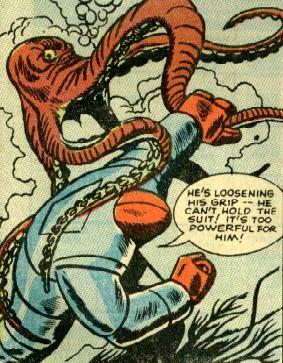 Earth's heroes watched the monsters summoned by Kid Kaiju defeat the Leviathons. After the battle Metallo and the other monsters were teleported back from where they came. (Monsters Unleashed II#4) - Metallo fought alongside Magneto and Marvel Girl (Jean Grey) against a Leviathon in Cairo, Egypt. Metallo is referred to by some as an Iron Man armor...but only because they both wore armor. There was no explanation given why the Cover version from the original story was seen in Monsters Unleashed, but it was a giant monster compared to Mike Fallon's armor, so there is at least an understandable reason to use the cover version instead of Fallon's armor. This was a story that was originally printed in Strange Tales I#75 as "I Made the Hulk Live" and later relettered and redrawn for Tomb of Darkness#22 to make Henry Pym into Poole's lab assistant.